A few months ago my children and I observed how my dozen or so strands of gray hair had remained steady in number since their first appearance a few years back. A couple of weeks ago I noticed with dismay that the number had increased twofold, the fierce pale strands fighting for their place amongst the mass of deep brown. A difficult season of parenting had taken place between those two surveys of my head and I knew without a doubt that out of the stress and straining of those days the silver had sprung its roots. My 12-year-old encourages me to embrace the tale-tell signs of aging. She quotes a passage from Proverbs and reminds me that it’s a sign of a righteous life, that it is my “crown of splendor”. If I look from the right angle, I can see the new gray stands as an affirmation that I’m not over-exaggerating that short but stormy season, it’s a marking post that I faced something truly difficult and I’ve arrived on the other side. I simply didn’t know my crown of splendor would be arriving at the age of 37. What if the same process that produced these silver strands also worked in reverse? For example, today was the opposite of my days a few months back. The April sun was warm, while the shade allowed a playful caress of wind. Instead of fighting, each of my kids engaged in a creative activity, entirely unprompted by me. My six-year-old sat before me in her red wagon, first drawing a map of an imaginary land and then typing a story of giants and dragons. Beside me sat my ten-year-old (who has spent much of the last year hating any act of school-ish activity) writing chapter five of a story. The twelve-year-old worked on a “creaturepedia” for her own story and the oldest worked on a script for a project that she’s begun with friends. This is how the day began and this is how the day continued for hours and I sat near them all, reading a book and saying a quiet thanks to the Lord. What if, with the same power that conjured those gray follicles into my hair like wild kudzu, a day like this could just as magically change a few of them back to the rich brown of youth and hope? This too, would be a kind of affirmation, that each day may brings its own mercies, its own renewal. At this very moment, there is silence around me. Truthfully, it is not silent, because there is a ticking clock, the sound of a dog roaming outside, and an occasional chicken chattering in the backyard. But the normal soundtrack of children arguing and “I’m hungry” is absent, so to me these other noises are still a kind of silence. We are finishing up five days of housesitting for friends. They only live fifteen minutes from us, but I’m fairly convinced that when you turn onto their dirt road, away from the matching houses of the neighborhood in which their home is nested, you cross a portal into a different zone of living. A dog reminiscent of a polar bear approaches you as you exit your car. As you enter their sun-filled house your eyes move from the shimmering honey jars stacked over their kitchen sink (fresh from their own bees) to the big picture window where colorful woodpeckers and chickadees dance on the bird feeder outside and finally your gaze lands on the books, and then more books. It is a home in which the doors are never locked (that’s not a metaphor, they really aren’t ever locked that I know of). The most striking feature, aside from the generous hearts that run this home, is the room to breathe. Inside the house there is space. Outside the house there are benches, swings, hills to climb, welcoming paths and lanterns in the woods. For our family of six, who live in a small three-bedroom house, space is a gift. For our family, in which a step onto our driveway means we’re practically stepping onto our neighbor’s driveway, space is a gift. For our son (a young man of ten years with three sisters), the space calls him to adventure. He’s had a challenging winter of hating school and suffocating in a small space with sisters who like to be in charge and highlight his mistakes. Here, he rises early, checks the animals, and heads out to the woods, a sturdy walking stick in hand. He doesn’t complain about taking out the trash, or cleaning up a mess. He’s more patient and confident, in this space. For our two older daughters, they’ve left email and other technology behind and now venture into books and board games. “I haven’t read a lot this year,” my oldest daughter told me last week. This week she has read for hours, diving deep into stories. “Can I please play on the iPad,” she asks me when she finally tires of reading. “No,” I answer, though inwardly I’m wondering if I’m drawing the line too firm. She’s fourteen and I’m trying to loosen the reigns. A few minutes later she is building card houses on the hearth of the fireplace and I relax. When their friends spend the night, they gather around me. “We’re bored,” the four girls stand before me, expectantly. “I can’t wait to see what you come up with,” I answer, as I continue to make dinner. A few minutes later they are in coats and boots traipsing out into the wet, cool weather. Soon after that they are in a tournament of card games. And for our youngest, our six-year-old, her older siblings are actually playing games with her, and being mostly nice about it. She’s figured out Hot-Cross Buns and Beethoven on the piano (we don’t have one at our house, this house has two), and she proudly walks in with two eggs from the chicken roost. “They’re still warm,” she says. From a winter that has brought regular strife amongst the kids and a lot of angst over decisions for my husband and I, this pocket of time and space is a bit of healing. A time to slow down. A time to remember to play. A time to sit in silence and breathe. Tomorrow we will have to cross the threshold again, back into the world of work, school, expectations, and technology. But this time has soothed the lingering scabs of a tough season. If you go to an art museum with your four children, you will see the art fast, a colorful blur of masterpieces. First, the quick pace will be set by your five-year-old, who will drag you from painting to painting (skipping several pieces or walls at a time). As you try to avoid whiplash during this process, you notice the 14-year-old old has a smile turned upside down and is grinding her teeth because she feels crowded by her siblings and grumpy because she has to rush through the art (even though she doesn’t appear much more interested in the art than the five-year-old). Eventually you notice the five-year-old has stopped dragging you and now has her arms lifted toward you to be carried. When you bend down to pick her up you notice the woman with the headphones, who is standing still, listening to the audio tour, and you think how different the art would look at her pace, which seems almost like slow-motion compared to your own speed. Your attention turns to your nine-year-old son and you know that at least twenty-six minutes have elapsed since he last ate and you calculate how much time is left before “I’m hungry” escapes his lips. You are now the one that picks up the pace, urging everyone through the exhibit and finally to the stairs that lead to the room the kids have been waiting for, the art-making room. Coats are tossed your way as they disperse to different stations. You think wistfully of putting your own hands on the fanned paintbrush or making a white line on the black paper in front of the wooden figure. Or maybe making a short animated movie with the giant guinea pigs at station number six. But you hold the coats and the bags of art as they accumulate. You smile, seemingly amused at your daughter’s cute response, but really you’re thinking again of the woman with the headphones, who walked the exhibit, without any fear of whiplash. It’s late in the night and the house is quiet except the muffled tick of the clock, the white noise of the refrigerator, and my fingers sporadically tapping these keys. It’s dark except for the Christmas tree lights a few feet away, little stars of light shining near my computer and across my patchwork blanket. A glance at the clock tells me that it’s not late at night like I first thought, it’s actually the first hour of Christmas Eve. By this time tomorrow, the presents will be piled under the tree and the stockings laden with jelly beans and and candy canes and miniatures treasures. True to our personalities, my husband and I have been finishing up our shopping at the last minute, and we’ll be anxiously awaiting the last Amazon box, due to arrive “by 8pm on the 24th”, according to the tracking data. We’ve budgeted and agonized over the purchases, adding numbers and checking the kids’ wish lists and doing our best to buy three presents of similar value for each of our four children. Most likely we’ve guessed pretty well thanks to their detailed lists, and after a frenzy of paper ripping, the kids will all be happy with the presents. Tonight(this morning), as I think over their presents, I’m dissatisfied that I can’t give them what I long to wrap and place in the their hands and in their hearts. I long to give them each an identity steeped deeply in the Lord. I long to help each of my children believe that they were lovingly and uniquely created by the hand of their Father. I long for them to see that nothing they do in this world, right or wrong, can make them any more (or less) loved or valued by God. I long for them to know that they don’t need to seek out their worth from their peers, or the internet, or even their parents, because their worth is beyond measure and has been since they were a gleam in their Heavenly Father’s eye. I’d like to give my oldest daughter a true glimpse of the God who died for her, who is with her now, and will be with her forever, when the visible, tangible things of this world have vanished. I’d like to give my second daughter a mirror that reflects the image God sees when He looks at her, a daughter radiant in strength and joy and beauty, a mirror that absorbs the lies of beauty that this world projects onto every magazine and billboard. I’d like to give my son a similar mirror that reflects his image unbroken, made perfect in Jesus, a picture of who God has made him to be: a protector, a lover, a maker, a brother, a son. I’d like to give my youngest daughter the gift of holding on to her beautiful and pure joy in the Lord and His creation, a joy that can’t be stripped away by the darkness of this world, or by the act of growing up. I don’t have to power to give my children the gifts of faith, love, joy, peace, and hope. I can offer my prayers, I can offer my imperfect self with my imperfect love of Jesus into their daily lives, but I always come up short of how to fill the needs I see in their hearts. What are Legos or a new scarf compared to the gift that arrived on the very first Christmas? Because of that gift we were all given a new identity. We became adopted children of God, a brother(or sister) to Jesus, and heirs to the Kingdom. Lord, give them gifts that I cannot purchase or manifest by my will or desire. Give them gifts that will not gather dust in the corner of overcrowded closets, gifts that will instill a deep joy even when worldly happiness is in short supply, gifts that will hold them up when the world wants to pull the rug from their faith and hope. In truth, the gift was given long ago, Lord help them to receive it. I’ve never been good at writing thank you notes. I blame it on my mom, because she didn’t make me write them (love you, momma!). And my kids will blame it on me, because I don’t make them either. In theory, though, I like the idea of thank you notes. My kids receive thoughtful presents or the gift of time from a relative, enjoy it and then, moving at the speed of life, they forget and move onto the next thing. In truth, I’m just like them with the daily gifts of life. I am guilty of living moment to moment, worry to worry, just keeping my head above the water until the next wave of worry comes along. I easily miss the amazing gifts that arrive with each new day. I’m not good at thank you notes, even if I write them I usually fail to send them. Seriously, I still have sealed thank you notes from our wedding a decade and half ago. Even keeping a thankful list usually falls by the wayside after three days. Lately though, art has become a way to linger in thankfulness a little longer. These past few weeks I’ve been grabbing my sketchbook to capture moments and then I revisit those sketches later with fresh paper and paint. It’s been a way to slow down, to mark the mundane that is really not mundane at all. The moments are really endless, but my hand can only catch about one a day or every two days. My oldest child in her cat-eye green sunglasses and favorite owl shirt, beautiful in her spirit, poised between childhood and becoming adult. All four children working together on a Lego movie. The five of us reading Edward Eager’s books out loud together. Every day of the fifteenth year of my marriage. My five-year-old marveling at every bit of life. Marveling at life, that’s what I’m doing when I take the the time to sketch a moment of our life. I’m looking at life with the heart of a five-year-old, awe-struck and thankful. I’m looking for answers. I want clear, specific answers. My eyes scan the book titles and I wait for a title to reach out with promises. Rather than start in the more obvious Self-Help section, I head to a smaller section with a taped label, “Theatre” (on second thought, it’s probably spelled with the American “er”). The section makes for short perusal because this is my neighborhood thrift store. There are thirty-two copies of Julius Caesar, twenty-seven versions of Romeo and Juliet, six slim paperbacks of Our Town, and a bland-looking book entitled Creative Drama that tries to lull me into a sympathy purchase every time I visit. I call out to the books as I take my time amongst the dusty tomes. Silence pervades, but it’s not unfriendly silence. I pause in the “Old Book” section. I’m pretty sure the muted black and tan book with the jazzy 1960s title: The Man’s Guide to Manly Cooking, just shifted its spine a couple of centimeters in my direction, but I call its bluff and move on. Even the food-related title, Chocolate for a Christian Woman’s Soul, doesn’t pretend to hold the wisdom I’m longing for tonight, although it does make me think about cookie dough and my stomach rumbles its own response. I stalk to the Education section, then Cooking and Children’s and eventually land where I should have headed all along: Fiction Softcover. The reason I didn’t start here is because this isn’t the section I go to for answers. This is the place I go to forget the questions altogether. This final destination is a clear sign that I’m surrendering my hope for answers in exchange for the novels in my hand that offer the promise of escape. It’s more than the other sections have offered thus far. As I make my way out of the maze of shelves, my arms full, I conjure one final surge of hope and stop in the Parenting section. Remarkably I find a hardback of the exact book I’d been looking at on Amazon earlier this afternoon. I add it to my stack. The bottom of my stack. For six dollars and thirty-seven cents, I leave with all I need. Later, I open up the first novel and my questions pipe down quickly, almost as if they’ve disappeared. But really, the trick is on me. Inevitably, a dive into the world of fiction, brings me back to the surface of reality with a new perspective on my life and the questions of my heart which, most likely, are different questions than the ones I thought so pressing in the thrift store earlier tonight. As I begin the first strokes, it’s as if my senses are underwater and the world around me becomes muffled and distant: I’m tuned only to my heartbeat, this paper, and the tools in my hand. I layer color and line and I’m in the Beautiful In Between– past the initial burst of doubt and fear, but not yet to the moment when my hand stops for the last time and the incarnation is revealed to match my vision, or not. I’m tempted to stop now, and the hesitation invites the voices back. “Tomorrow,” the first voice soothes. “You could leave it right here, in this state of possibility and come back tomorrow.” But the latter voice tells me that tomorrow I will say the same thing, “I’ll leave it as it is, for just one more day.” If making the first mark on the blank page seemed like the hardest part, I know in this moment that continuing is by far the more daunting choice. The moment in a story when everything goes wrong is sometimes called the Dark Night of the Soul. I see a similar moment approaching in my work and I know that’s why I’ve paused brush and breath. Soon the original sketch will be hidden completely and my vision all but lost. It is tempting to stay in the before, where possibility reigns. The truth is, sometimes it doesn’t. Not every piece emerges from the darkness. Sometimes, though, it does work. My hand goes back to the brush and from layers of paint, the original vision emerges. It’s altered, of course, because process changes things. Neither is it perfect, because I’m not perfect. But there is beauty in the trying. And what has surfaced is better and truer than the original spark of an idea. Either way, what do I do after? I begin all over again. Hope has been born in the darkness, when the vision was momentarily lost but I continued anyway. Gathering the courage of a superhero and the foolishness of a lover, I face the white chasm, again. I looked over at my eight-year-old, earnest in his fears and self-doubt, his face scrunched in a ball of misery just like the paper crumpled in his hand. He didn’t have to sketch with us, it was the first day back to school after all, I could have let it go. It would have made my own sketching time much easier if I’d released him from trying. And then I added other words about how his drawing didn’t have to look just like the cup of hot chocolate he was trying to sketch (that’s right, I’d even sweetened this sketch time with hot cocoa and homemade cookies). And his older sister helped by declaring her drawing wasn’t going as planned so she was going to free herself from being realistic by doing a one-line sketch instead. With enough cajoling, he eventually finished a sketch and I knew there was a small notch on his belt of belief that he could finish what he started, a notch that would help with the next challenge that was sure to come. I put his finished sketch in a frame and that night I was a very tired Mama who was glad we were a family who did hard things. Now I didn’t like how the tables were turning on me at all. I didn’t like the suggestion that I had as much to learn as my children about overcoming obstacles and pushing through problems. I wanted to think of the beautiful release of quitting without equating it to my eight-year-old balling up his drawing and throwing it in the garbage. I wanted my internal fit to look a little less childish than my son’s, but it sounded mockingly the same. I realized that I was in a hard place and it wasn’t that easy to push through the moment, which turned me toward empathy and grace for my son. If I couldn’t instantly conjure the strength to get to the other side of my challenge, then I couldn’t expect such a quick turnaround in his countenance either. I had to do more than get frustrated and impatient, I needed to come along beside him, be intimate with his struggle, and call with him to the Lord for help. This week my son and I have pushed through some hard things. He’s gotten out new paper and tried again. I’ve sat beside him. He’s wisely taken a break from a project, with plans to return to it when he’s ready. I’ve allowed him the space to struggle. He’s gotten my help to finish a math assignment. And I’ve stayed, minute by minute, hour by hour. There was some chocolate involved in the day, some frustrated words, as I’m sure there will be tomorrow. My son and I both have assignments in front of us daily. I’m handing out his assignments and God’s handing out mine (of course, God is actually teaching us both). Today I got a little notch on my belt to remind me next time I don’t have to give up, that I can push through hard things. As our family gets more intentional with our time this year, my own goals have floated to the surface. My goals stem from a desire to grow in artistic skills and also to make room for things that I delight in doing, that refresh me in a brief time of respite. And underlying those goals is a hope that God will shine His light through whatever I’m creating with my hands or my words. As I wrote “Aimee’s Writing Time” on the Saturday morning slots on the family calender, a little shiver circled around my heart. “Can I really do this, give myself this time?” I wondered, feeling both spoiled and worried at actually using the time. To put the time on the calender frees me to say no to other things that come up, decisions that sound odd when I say them out loud to friends. Me: No, I’m not going on the retreat, I have writing goals this Spring and if I set a weekend aside, it will be to write. Friend: But you have to go! Me: I’m really not going to go. In addition to setting aside time to write (specifically to adapt a children’s chapter book into a play), I’m taking a year long art class with my favorite art teacher, Carla Sonheim. It’s called The Year of the Fairy Tale. I’ve written before about the luxury of being a student and about recovering from a perfectionism that petrified me from making art. Now I get to continue on this journey, mixing my favorite art teacher with stories, and the kids get to come along as well! 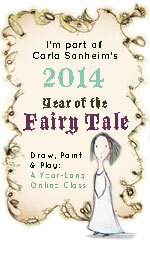 Carla also has an exciting schedule of shorter classes lined up for the start of the year. Coming soon are Faces 101 and GelliPlate and I recommend both. Don’t let the the online aspect bother you or scare you away. Taking one of her online classes is like having her come and sit at the table beside me, show me her work, share her process (successes and mistakes) and encourage me to jump into the art supplies and make something. She’s also great at never leaving me with a blank page. There is a blob of paint, a series of words, almost always something rather than nothing, a place to begin. If it’s art that makes you breathe easier and loosen your shoulders (or if you feel in your bones that art could be that way for you if you could fear less and art more), then put some art dates on your calender and sign up for a class. If it’s not art, then find out what it is, write it down, and say no to something else! Last night my husband and I spent an hour getting ready for our time with the kids of brainstorming a family mission statement. We used this helpful free tool to poke and prod our thoughts about what makes our family tick and what we’d like to change for the new year. As I read through some bits of inspiration, I found this piece by Erma Bombeck. Even though I’m only thirteen years into motherhood, I can still identify with her regrets and the values she wished she’d chosen to govern her day to day choices. I face these same choices every day. “If I had my life to live over,” written by Erma Bombeck near the end of her life, details the values Bombeck wished had guided her daily decisions.